Omelettes are infinitely customizable! This recipe is perfect for busy weekdays, but below we offer a few variations that can be delicious when you have some more time to play around in the kitchen. Whisk eggs, water, salt and pepper. Spray 8-inch (20 cm) non-stick skillet with cooking spray. Heat over medium heat. Pour in egg mixture. As eggs set around edge of skillet, with spatula, gently push cooked portions toward centre of skillet. Tilt and rotate skillet to allow uncooked egg to flow into empty spaces. When eggs are almost set on surface but still look moist, cover half of omelette with filling. Slip spatula under unfilled side; fold over onto filled half. Cook for a minute, then slide omelette onto plate. Western Omelette: Spray skillet with cooking spray or heat 1 tsp (5 mL) vegetable oil in skillet. Add 1/4 cup (60 mL) finely chopped ham, 2 tbsp (30 mL) chopped sweet green pepper and 1 tbsp (15 mL) finely chopped onion; cook, stirring frequently, until vegetables are tender. Pour in egg mixture and cook as directed in the Basic Omelette recipe. 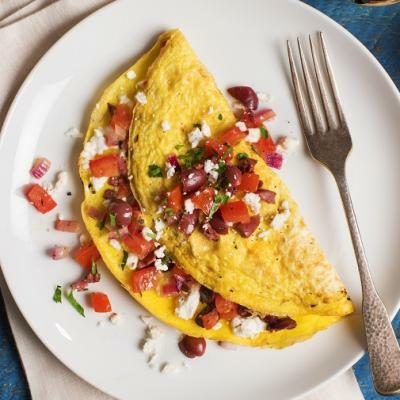 Fine Herbs Omelette: Add 2 tbsp (30 mL) finely chopped parsley, 1 tsp (5 mL) finely chopped green onion, 1/2 tsp (2 mL) dried tarragon and 1/8 tsp (0.5 mL) finely chopped garlic to egg mixture in the Basic Omelette recipe. Cook as directed. 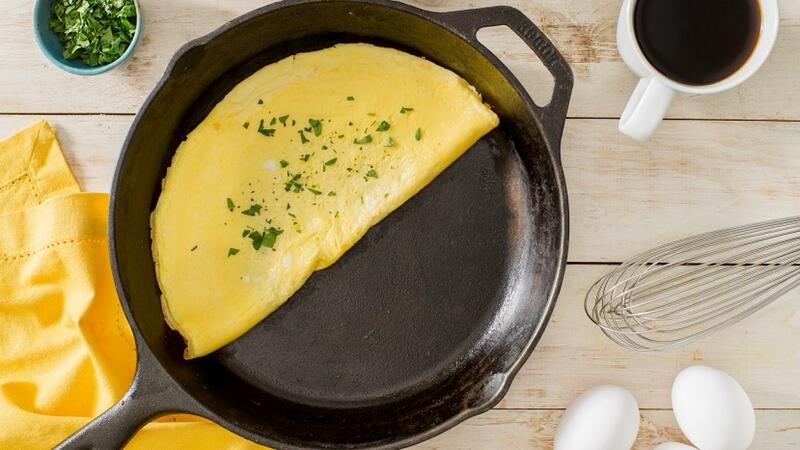 Using the proper skillet or pan is important to successful omelette making. The ideal skillet for a 1, 2 or 3-egg omelette is about 8 inches (20 cm) in diameter at the base. It should be shallow with sloping sides to make it easier to slide the omelette out of the skillet and onto a plate. 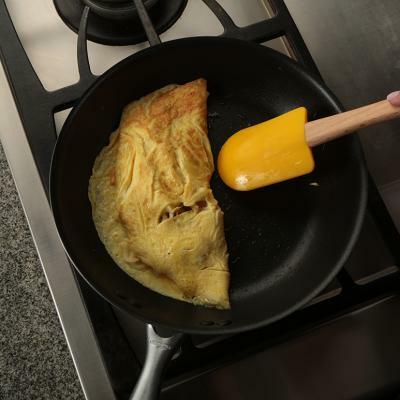 An omelette can be made quickly and easier if the skillet is hot when the egg mixture is added. The skillet is hot enough when a drop of water rolls around instead of bursting into steam immediately. Preparing individual omelettes, rather than one large one, will result in lighter and fluffier omelettes that are easier to handle. 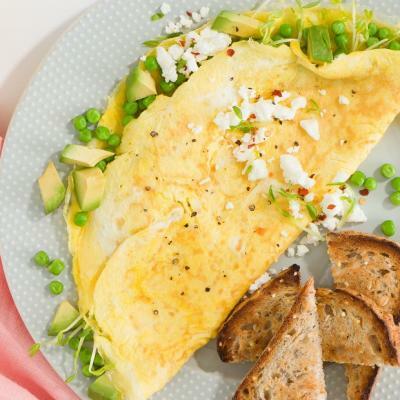 The Basic Omelette recipe can be multiplied for as many servings as you need. Use 1/2 cup (125 mL) of egg mixture for each 2-egg omelette and 3/4 cup (175 mL) for a 3-egg omelette.